How do I view the settings for an account in Gauge? 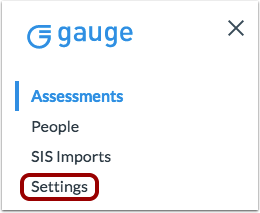 You can view the settings for your Gauge account. On the Settings page, you can change your account's timezone. 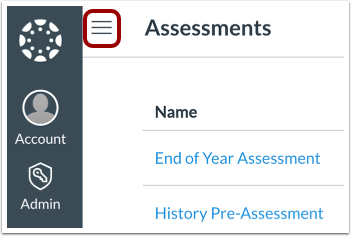 When creating a deployment, your account timezone will determine when the assessment will be deployed to students. 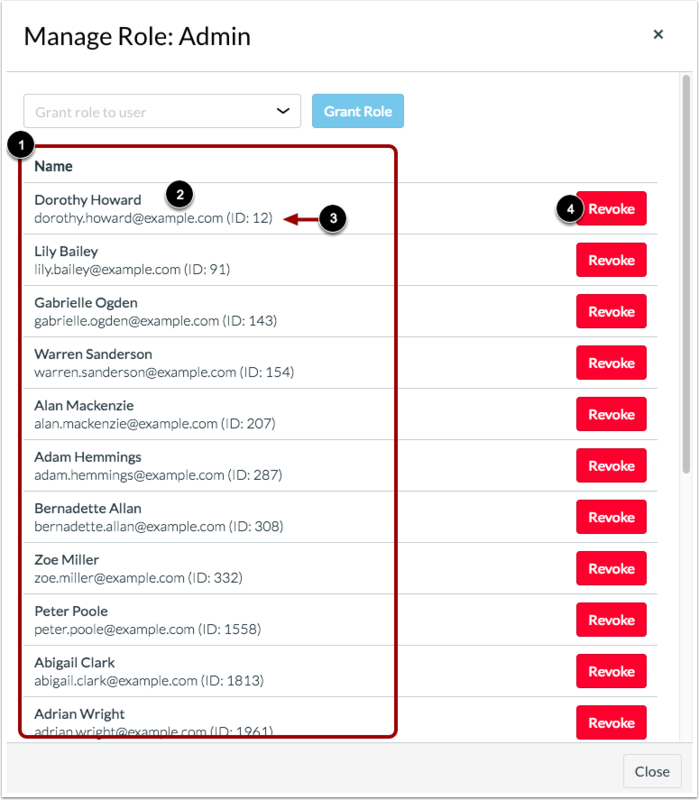 You can also manage user roles and registered applications. In Global Navigation, click the Gauge link. To open the Gauge Navigation Menu, click the Menu icon. View the Settings page. The Settings page includes general settings , user role settings , and registered applications . To change the timezone for your account, click the Timezone drop-down menu  and select the option for your timezone . 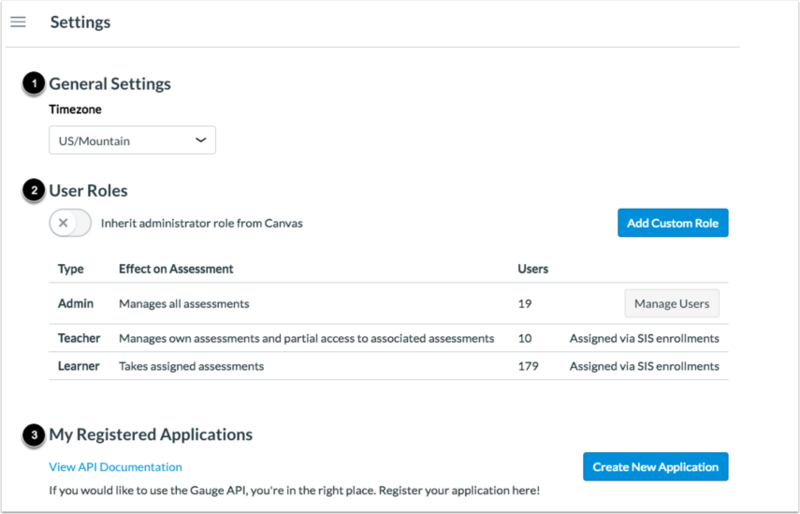 In User Roles Settings, you can view the role types in your account , the effect each role has on assessments , and the number of active users assigned to each role . You can also view how each role is assigned . Teacher and student roles can only be assigned by SIS enrollments. The admin role can be inherited from Canvas or assigned manually. By default, the Inherit administrator role from Canvas option will be enabled . To add a custom role to the account, click the Add Custom Role button . To manage admin roles, click the Inherit administer role from Canvas button so the option is turned off . Then click the Manage button . View the admins for your Gauge instance . You can also view the email address  and ID number for each admin . To revoke admin rights for a user, click the Revoke button for the user . 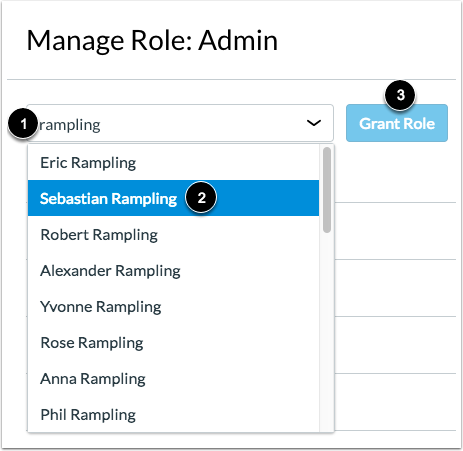 To grant admin permissions for a user, type the name of the user in the Grant role to user field  and select the name when it displays below . Then click the Grant Role button . In Registered Application Settings, you can view the name  and details  for each registered application. Details include a client ID  and secret key  that can be used by the application owner to get access to the Gauge account's API. Learn how to create a registered application. Previous Topic:How do I format CSV files to upload SIS data in a Gauge account? Next Topic:How do I manage custom roles in Gauge? Table of Contents > Admins > How do I view the settings for an account in Gauge?